Are you guys getting back together or what?! It's been a couple of months since Robi Domingo and Gretchen Ho released a joint statement confirming their breakup, and we've already sorta moved on from wishing they'd get back together. That is, until Robi's grand, romantic, sweep-me-off-my-feet kind of public apology on Monday night's Bb. Pilipinas 2017 pageant. In a report by PEP.ph, a surprise video of Robi played on the huge LED screen (for all of the Smart Araneta Coliseum to see, mind you) after a pre-pageant video segment ended. This all happened while the panel of judges, which Gretchen is a part of, got back to their seats after making their deliberations. 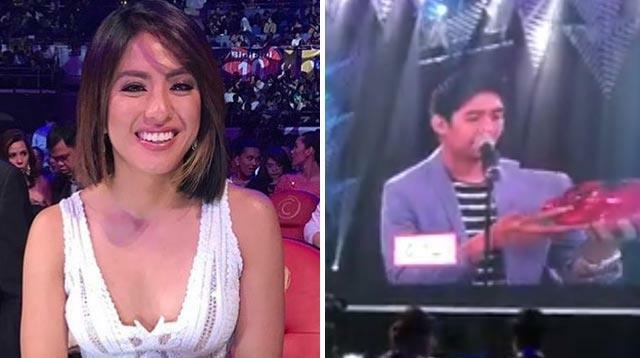 An audience member was able to capture a part of Robi's video and even a candid moment of Gretchen smiling while watching her ex-boyfriend profess his ~*love*~ for her! "Grabe no? Lots of things that happened. Gusto kong sabihin na sorry. Masakit, mahirap, pero kailangan. But trust me when I say this, during this process I think I could honestly say that I am saving up all my love for you. I wish I have more time kasi time is the best thing that I could give you right now."